Today, I was gifted with the joy of holding Chapel with our preschool. This is a short time with the children in the Sanctuary for religious instruction, story and song. I love the opportunity to speak a few good words to the children, most of whom I have no idea of their religious affiliation. In fact, I suspect that many aren’t followers of Christ or any other religious tradition. During this time I try and keep things pretty simple. Actually that’s pretty much my mantra for the Sunday sermon as well. In essence, it is an extended children’s sermon. Today was our first chapel time of the new school year. As such it was important to talk about the rules of the sanctuary and our time together. This was especially appropriate since the lesson we talked about was the Greatest Commandment. As the children were getting seated, I heard something that was interesting. One of the teachers was telling the children about where they could put their hands. The pews being filled with tempting books, pencils and papers is an almost sure draw for little hands. There was a lot of wisdom in what the teacher was doing. Rather than telling the children what they couldn’t touch, she was making it clear what they could touch. This approach is a reflection of both age appropriate teaching theory but also I think it is akin to the approach of Jesus’ teaching in the world. Far too often children, and adults for that matter, are told to live in the negative. We are told what we can’t do. Rules and laws often start with, “Don’t or shall not.” During our time I talked with the children about the Ten Commandments. This list is a prime example of prohibitive laws. A list of things you must do or things your are forbidden to do. I believe that while Jesus does make clear commandments, he most often frames his teaching in a positive manner. Take the passage that my chapel time was centered on today, Matthew 22:34-46. Even though he speaks in “shall” terms, the tone and tenor is far different than what the people had been experiencing from their religious society. Jesus, uses the Shema of Deuteronomy 6:5 and unites it with Leviticus’ instruction to love one’s neighbors. Jesus answers the question of what is the greatest commandment by applying the historical faith of Israel. I hear a different approach in his use though. He doesn’t do it as a prescriptive or compulsory law. Instead I hear an answer that opens up positive ways of being. He lifts up the two most valuable, positive virtues and practices anyone can have in their life, love for God and neighbor. He reminds us that in this world it is equally if not more important to do the good things than avoid doing bad things..
As I talked with the children, we spoke of all the rules that our preschool has. Of course they cited the rules about hitting, cutting line and running. I don’t know if I did it or not, but I tried to show them how even these rules are intended to help them love God and their neighbors. I think this work of framing the freedom we receive in God’s law is a much needed work in the church today. One of the common complaints about the church is that all it does is tell people what to do and think. How can we start to take the historical faith we have and frame it in a positive way? This causes me to think about how our church approaches leadership. The negative way of leadership would be for the session to be the gatekeepers and authoritative managers. Our approach at Christ Presbyterian Church is one that is permission-giving and freeing. How often has the church chained the Gospel and its’ members to the wall with rules and regulations? How do you express the love of Christ in a positive and freeing way in you life? 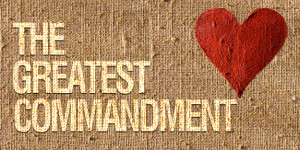 This entry was posted in General, Tuesday Tidbits and tagged christ presbyterian church, commandments, congregations, discerntment, God, growth, hearing, hope, keeping it simple, leadership, listening, ministry, pastor, positive, practices, rules, spiritual growth, the greatest commandment by Geoff McLean. Bookmark the permalink.